Bordered by Yonge Street to the west and Bayview Avenue to the east and from Blythwood Ravine on the south to Lawrence Avenue on the north, Lawrence Park South also includes the area west of Avenue south to Eglinton Avenue. 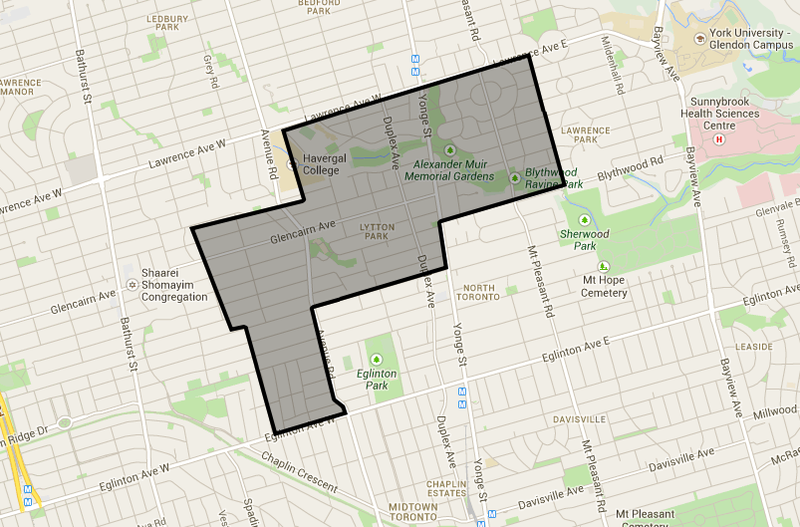 Like Lawrence Park North, this area includes three distinct geographic communities: Blythwood, Lytton Park and Allenby. As one of Toronto's first planned garden suburbs, Lawrence Park is a haven for ravine and park lovers. This is a dog owner’s paradise. Here you will find a wide variety of home styles including English Cottage, Tudor Revival, Georgian and Colonial and while most of these homes were built between 1910 and the late 1940s, there has been significant redevelopment over the last 20 years. Thankfully, most of the new homes that have been built in the area have been sensitive to the architectural style that already existed. Much of the retail of the neighbourhood is centred along Mount Pleasant Road as well as a successful commercial district along Yonge Street, north of Lawrence. There are many high profile restaurants in area, and the local shops include fashion stores, shops and children’s stores, sporting goods stores, gift shops, bakeries and coffee shops. The strength of the area remains its proximity to fantastic neighbourhood public and private schools, recreational facilities, easily accessible public transportation and quick access to Toronto’s Highway 401. Lawrence Park South, first advertised as an aristocratic neighbourhood in the early part of the nineteenth century, now forms part of the wealthiest postal code in Canada.